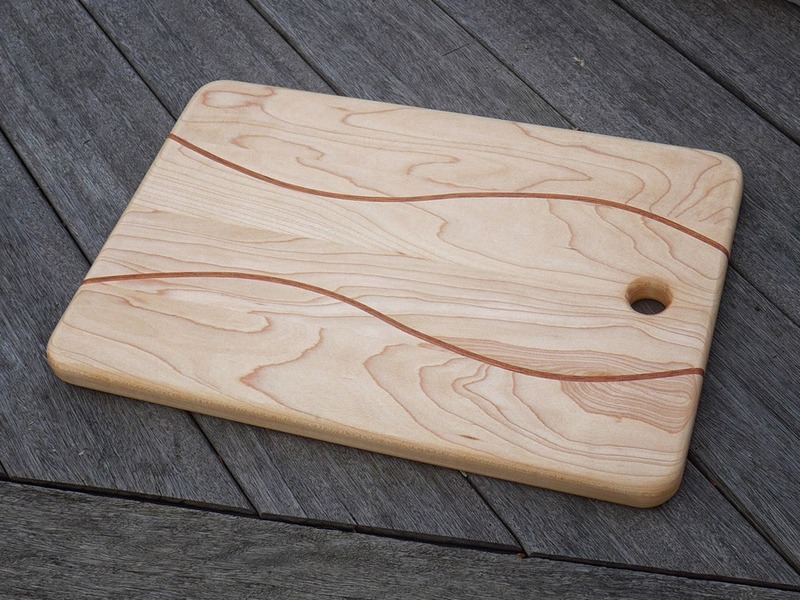 (Yet) Another bread board, but as usual I tried out a few new ideas / techniques in the making of it. The main new (for me) idea here was to have a wavy design instead of straight. 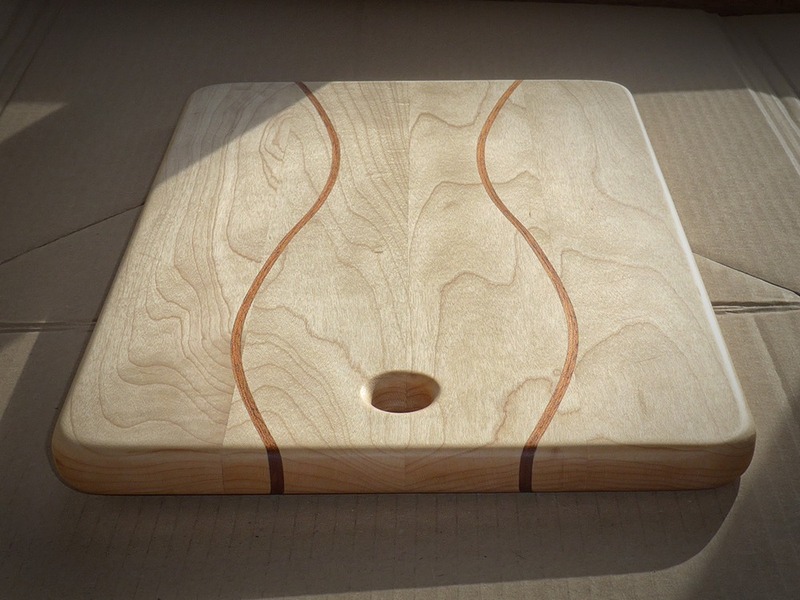 I used some Maple that had been in the house for months, so wood movement shouldn’t be an issue. 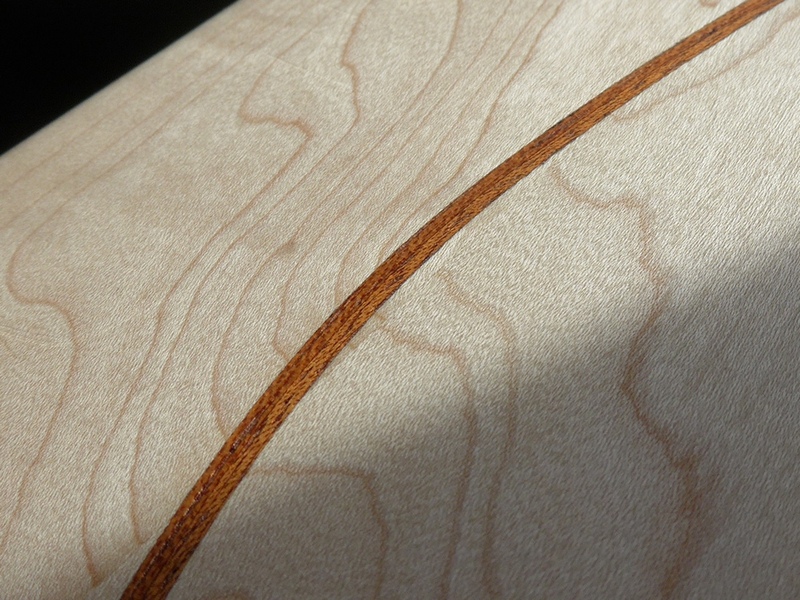 The wavy stripes were African Mahogany. 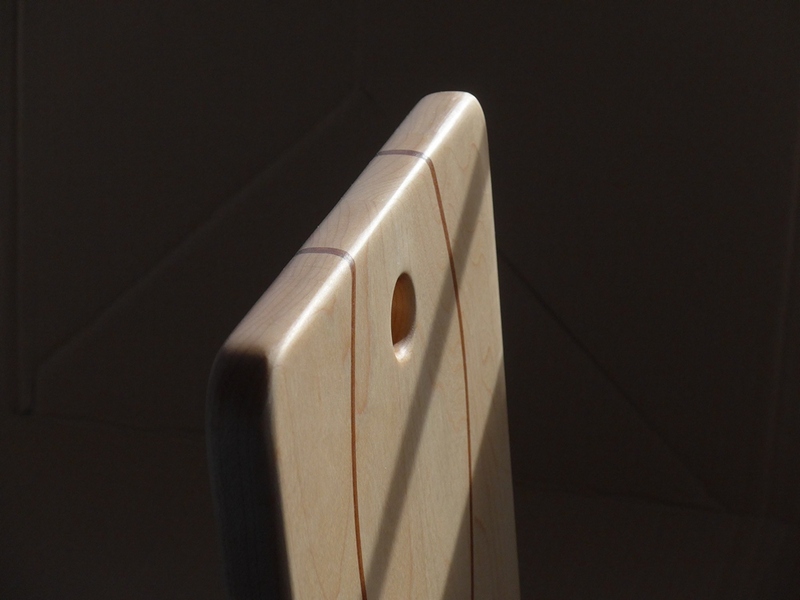 The design I had in mind called for a piece of wood thin enough to be bent without breaking, sandwiched between two pieces which form the two exactly-matching halves of a wave shape. And that was the crucial part – they must fit together exactly. 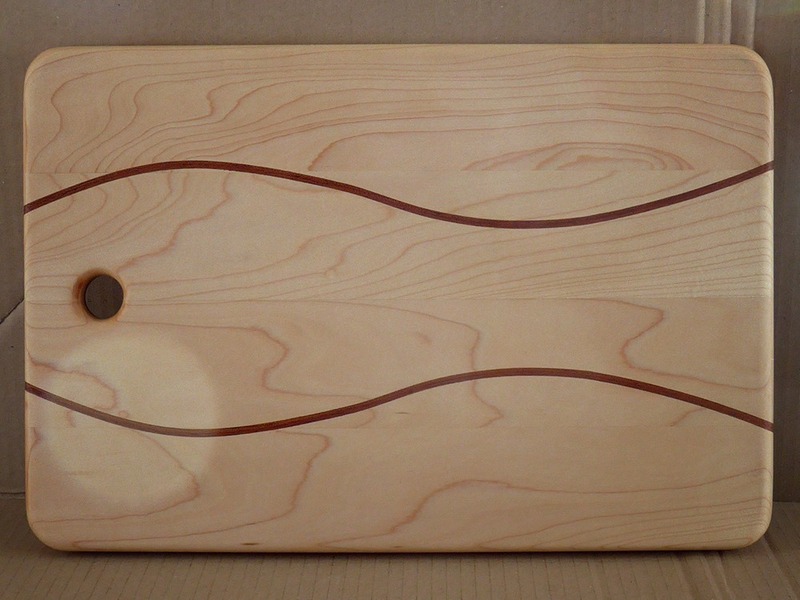 Additionally, my design was to be symmetrical so I needed to form two wave shapes that matched. 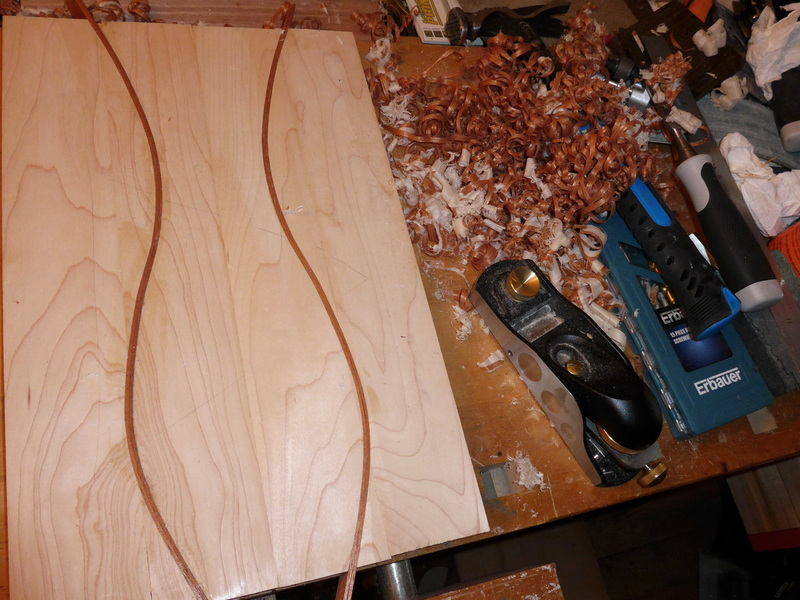 One option was to cut the wave in the wood freehand using the bandsaw. 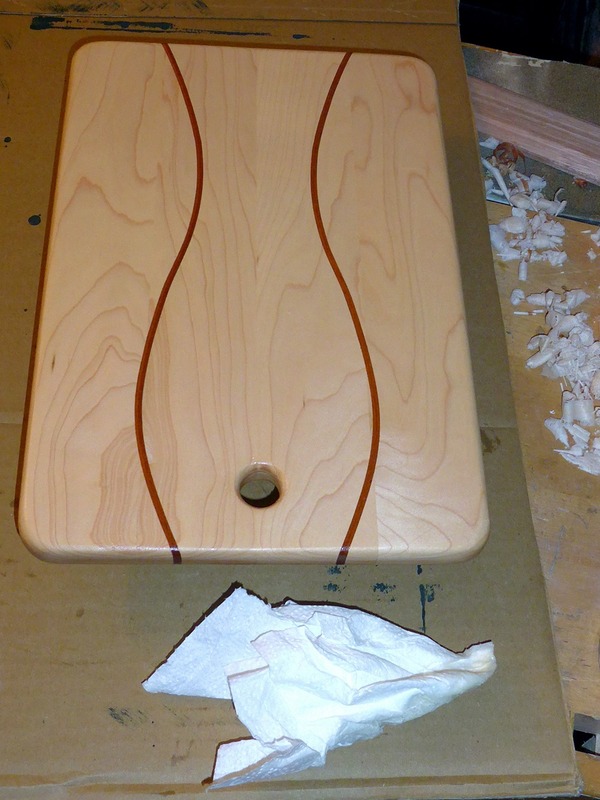 Theoretically that would have worked, but I didn’t rate my chances of being able to accurately cut two matching curves. 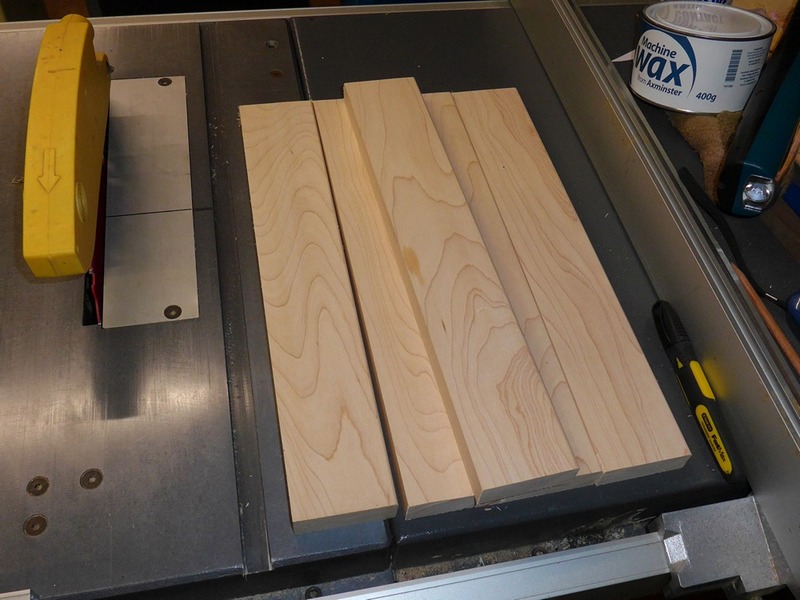 So I decided to use the bandsaw to make templates which I could then use, in conjunction with a bearing-guided router bit, to trim rough-sawn pieces to the exact shape. So all I needed to do was to make an accurate template. The first job was to draw the wave. 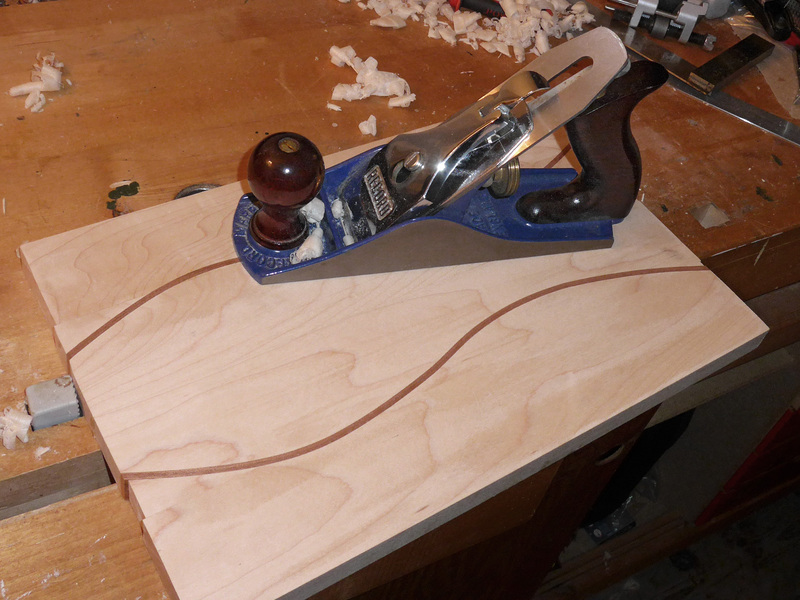 I remembered I had a ‘flexible curve’ in a drawer somewhere that I hadn’t used for decades. 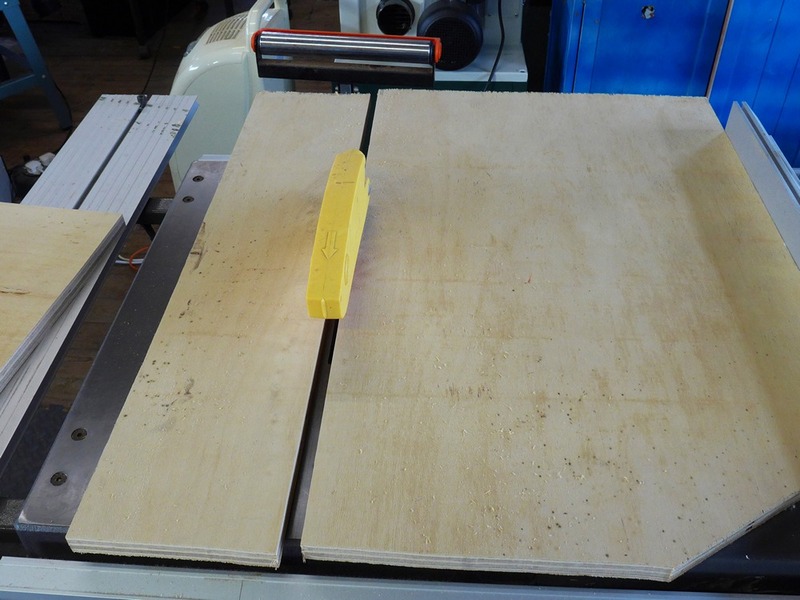 I found some 18 mm plywood to use, and cut it to size on the table saw. 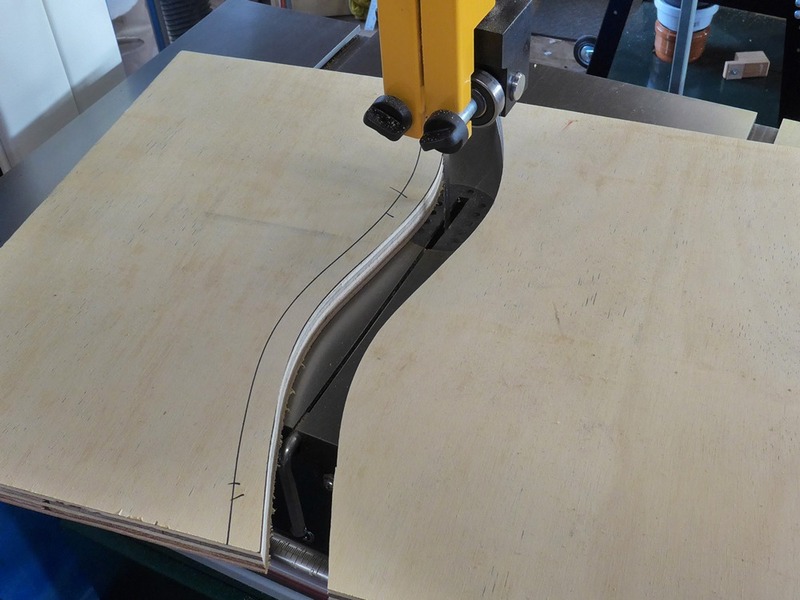 About 10 cm from the end of the cut, the blade started veering away from the marked line, so I stopped pushing the work-piece, adjusted position slightly and then continued the cut. 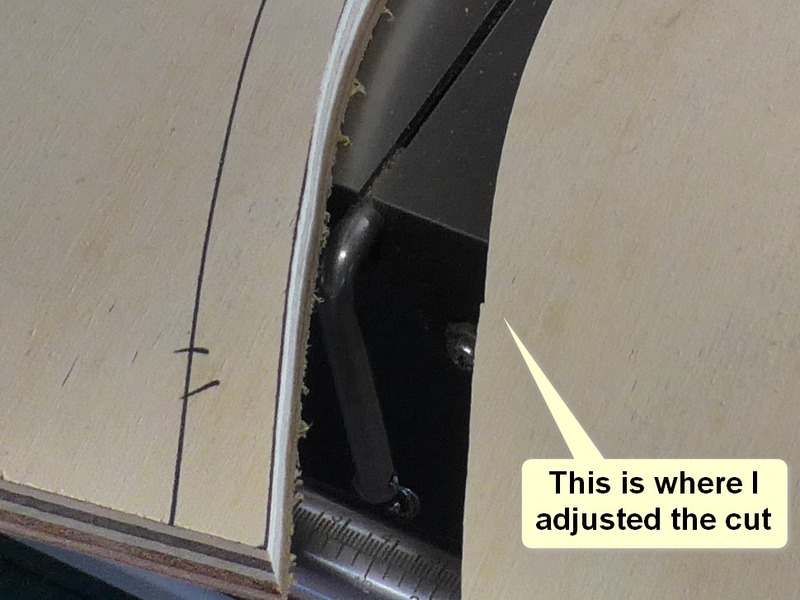 This was a bad move because it meant that the gap was no longer consistent along the whole cut. 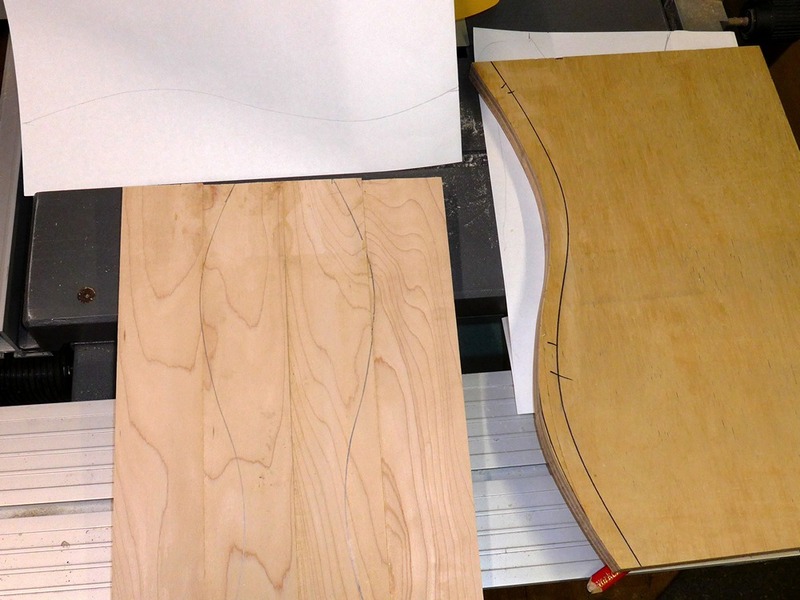 This meant that the two pieces would not match up exactly when brought together, which meant that any parts I cut using these templates would not match up either. This time I made the cut without stopping, but I wasn’t happy that I’d veered so far from the line (see above), so I glued them back together again! 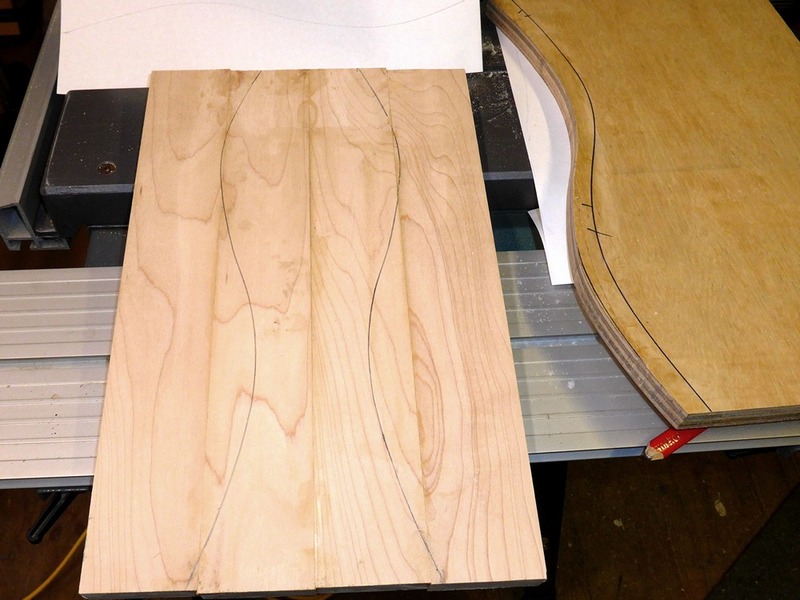 Then I practised my cutting technique on a few scraps of plywood before cutting the template for the third time! This time I was happy with the result; the two pieces fit together well and the bright light test revealed that the fit was good. 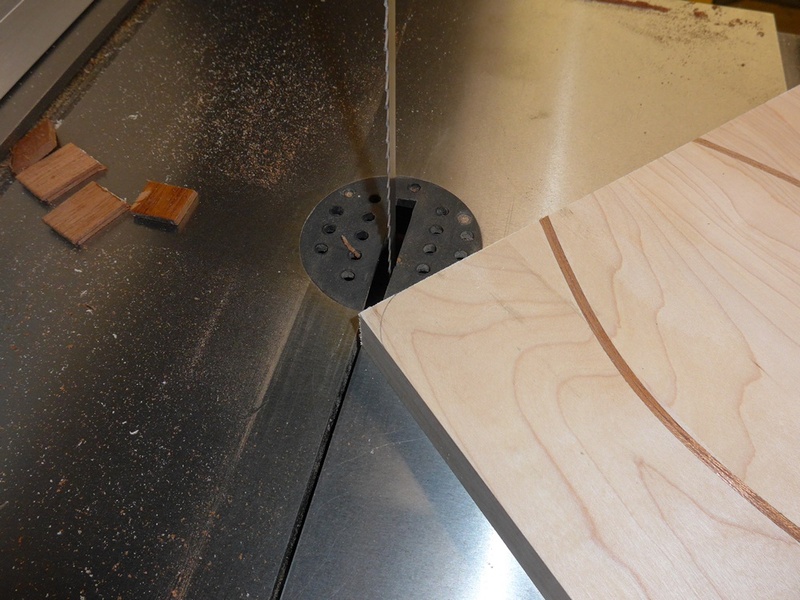 This time it didn’t matter if I wandered slightly off line while cutting, because the pieces would be trimmed to exact shape with the router. 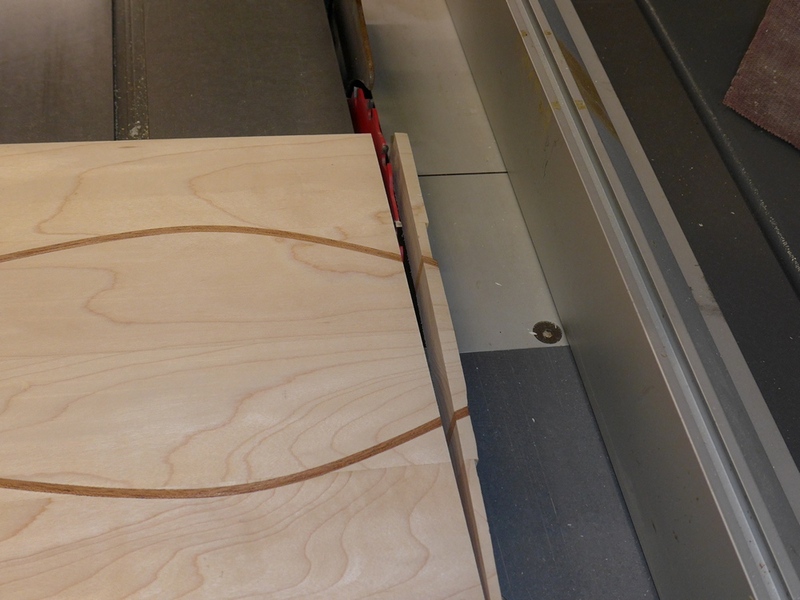 With some slight burning caused by the router cutter, the piece has now been trimmed to the exact shape of the template. During the trimming I could feel the work-piece move slightly, so the double-sided tape was slipping (probably not helped by the fact that I had reused the same pieces of tape between cuts). All three parts of the breadboard fit together well after trimming. 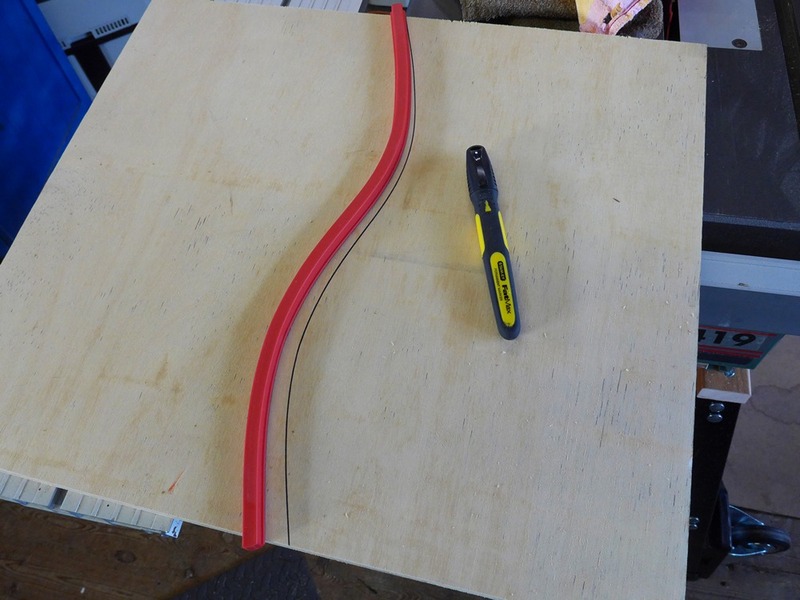 I next cut four thin strips of mahogany just under 2 mm thick, slightly longer than the board and wider than the thickness of the board. 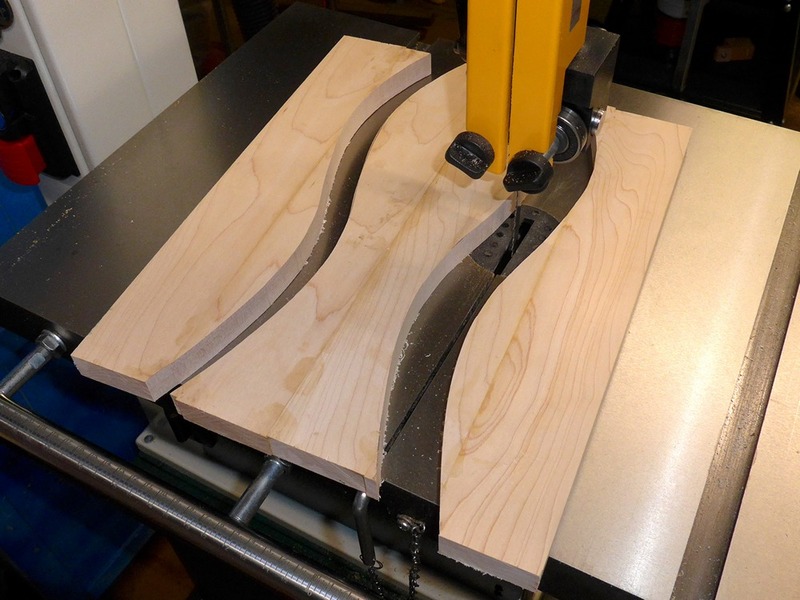 This was so I could use two very thin pieces for each curve rather than one thicker piece that would have been more resistant to bending. 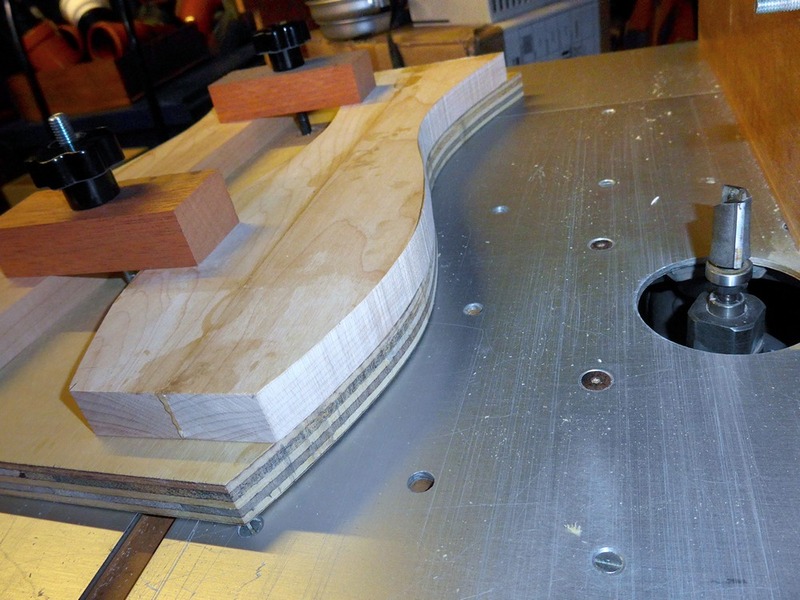 I positioned the strips between two parts of the board and clamped up, causing the mahogany strips to bend into the shape of the curve. 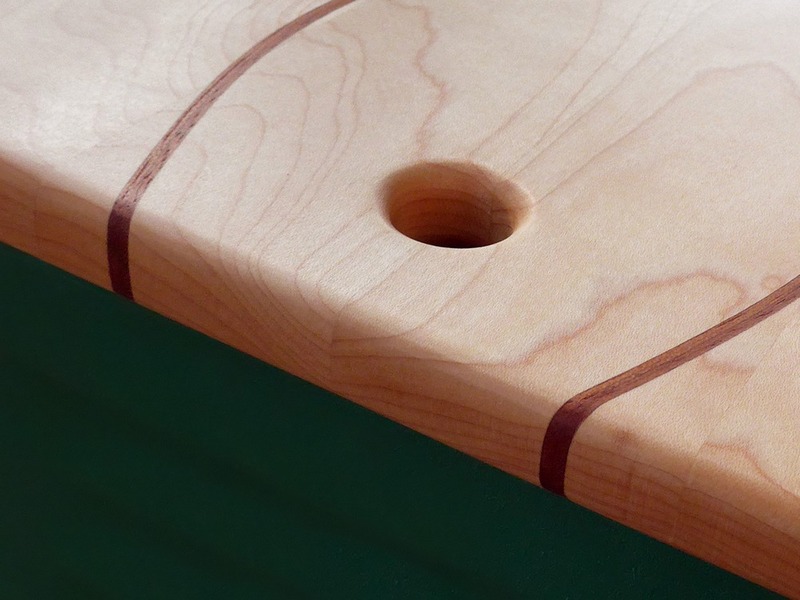 (I used the other outside part of the board loosely in position on the far side to allow the clamps to act on something square, as opposed to the other curved edge). 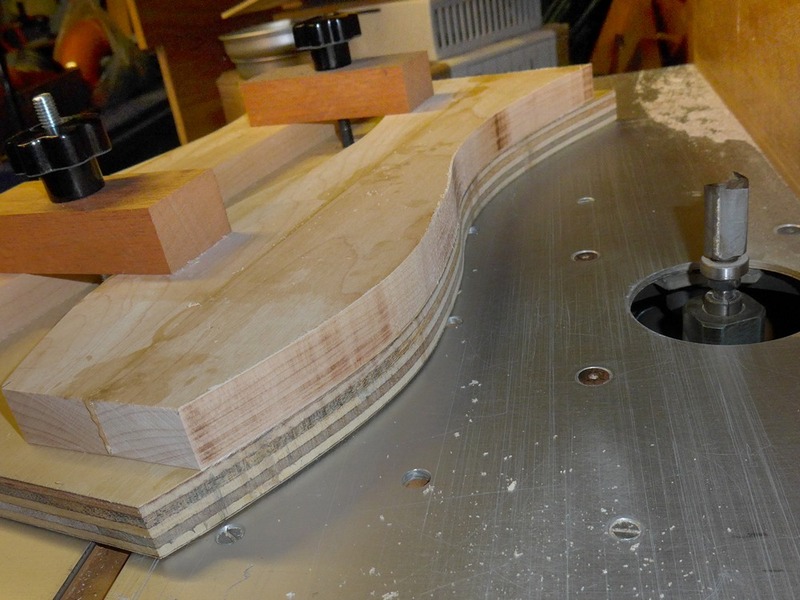 I wanted to make sure that the mahogany strips ended up protruding from the board on both faces, so that I could trim flush afterwards. 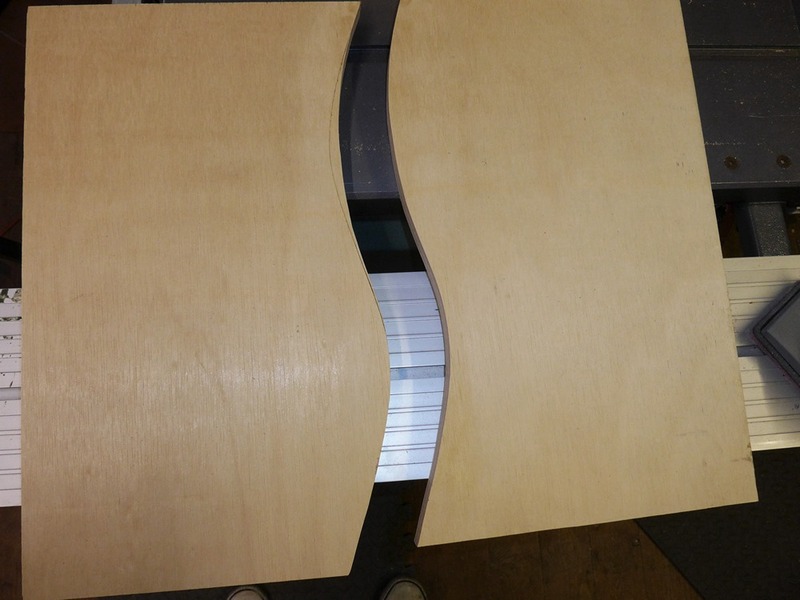 If I had rested the board parts and the strips directly onto the clamps I think there would have been a risk of the strips not being pushed down far enough, resulting in them being below the surface on the underside of the board. 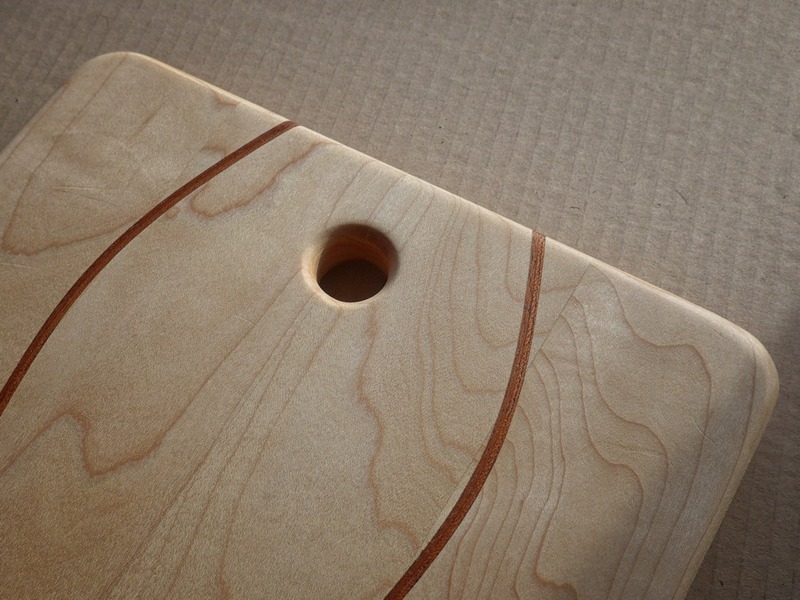 Using thin pieces of wood I raised the maple pieces about 2 mm off the clamps to ensure that the strips would be proud of the surface of the board on both sides. The disadvantage of this is that I could no longer tell if the tops of each part of the board were coplanar. 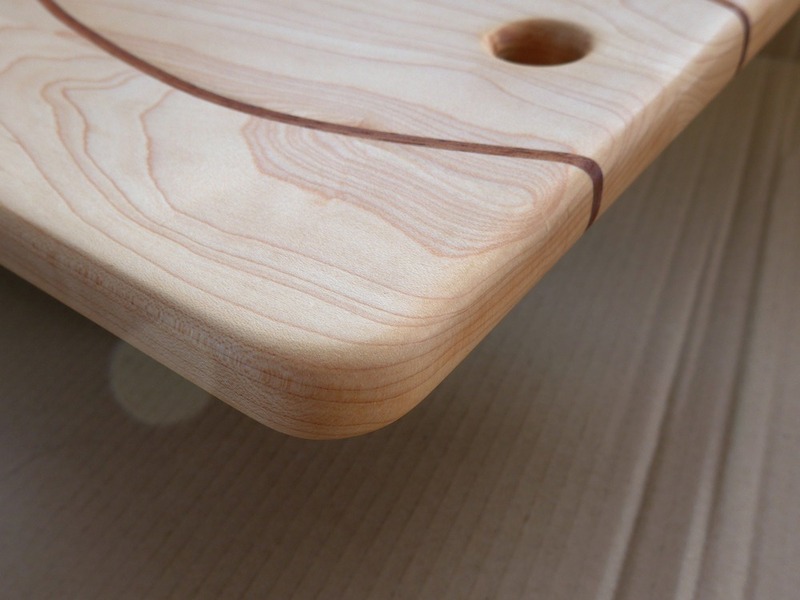 Normally I would be able to feel for a difference between the two surfaces by running my finger over the join underneath, but the mahogany strip was protruding and preventing this, so I just had to eyeball the edge and hope for the best. 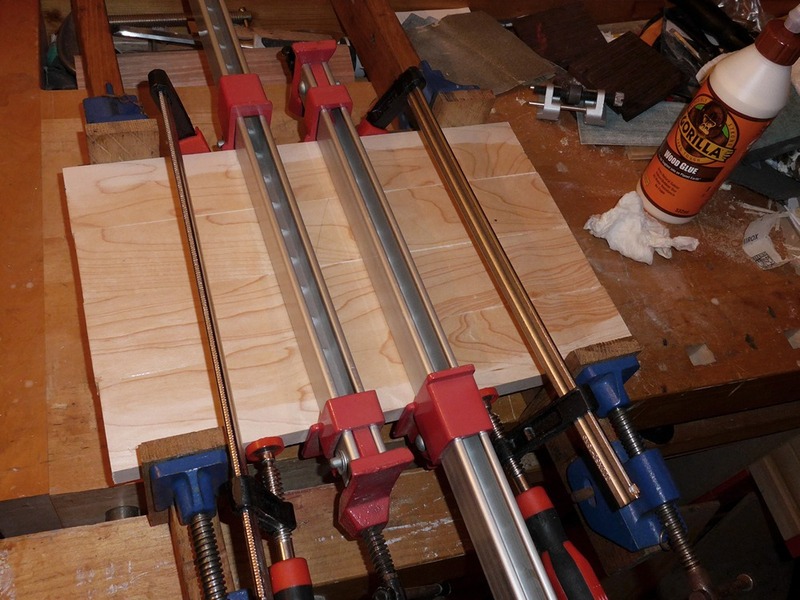 To make sure that the two pieces of maple either side of the strip were in the correct positions for their curves to match, I did a dry fit without the mahogany pieces and marked across each board with several pencil lines, which I made sure were lined up as I tightened the clamps. 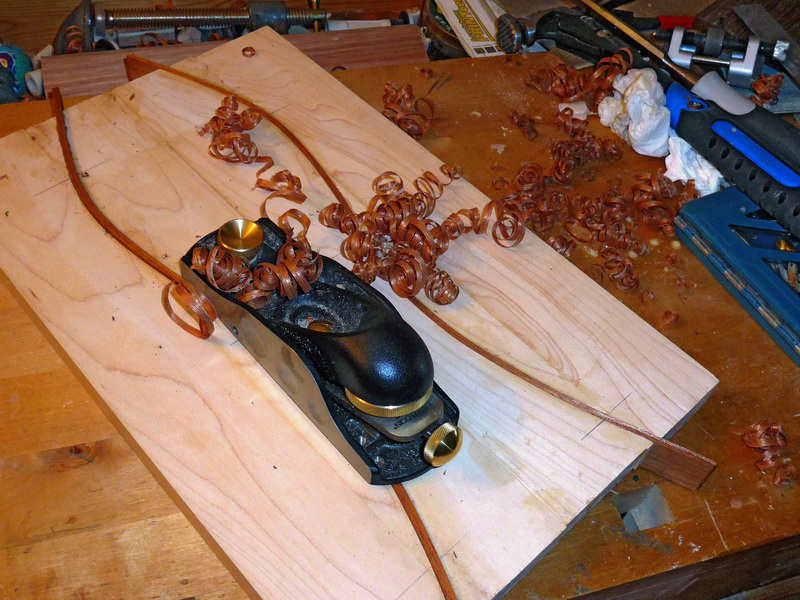 and then block-planed the protruding mahogany strips to be flush with the surface. 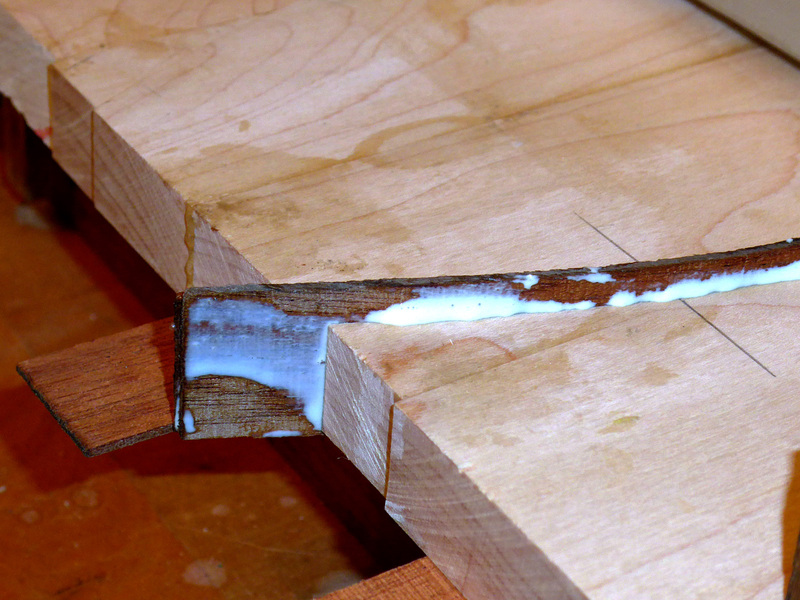 For various reasons this glued-up board was not as flat as it could have been. One reason was the aforementioned problem whereby I couldn’t tell by feel whether the parts were coplanar when I had clamped them together. 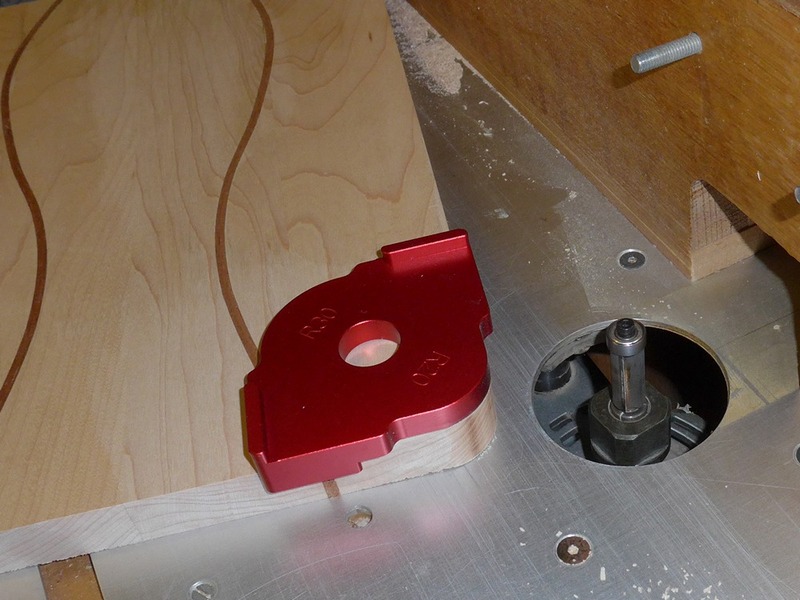 The other reason is that I had originally cut all the pieces of maple from a board that was not straight, and I had made no attempt to rectify this before glue-up. So there were a few ‘steps’ between the various pieces. 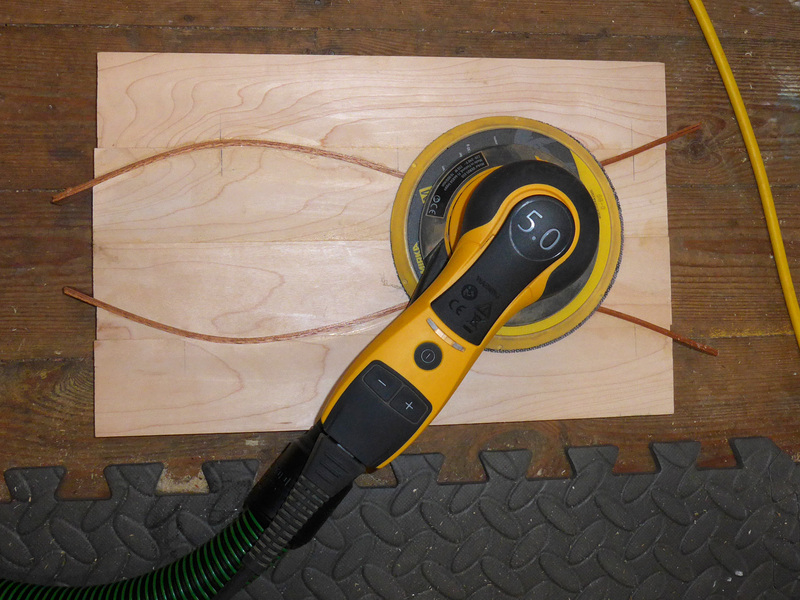 I spent quite a while using the belt sander and my random-orbit sander (with 80-grit paper) levelling it. That wasn’t the best way of doing it (unless you like turning wood into dust) and in my opinion wasn’t ‘elegant’. If I’d had a thicknesser wide enough (might get one soon), I could have used that. 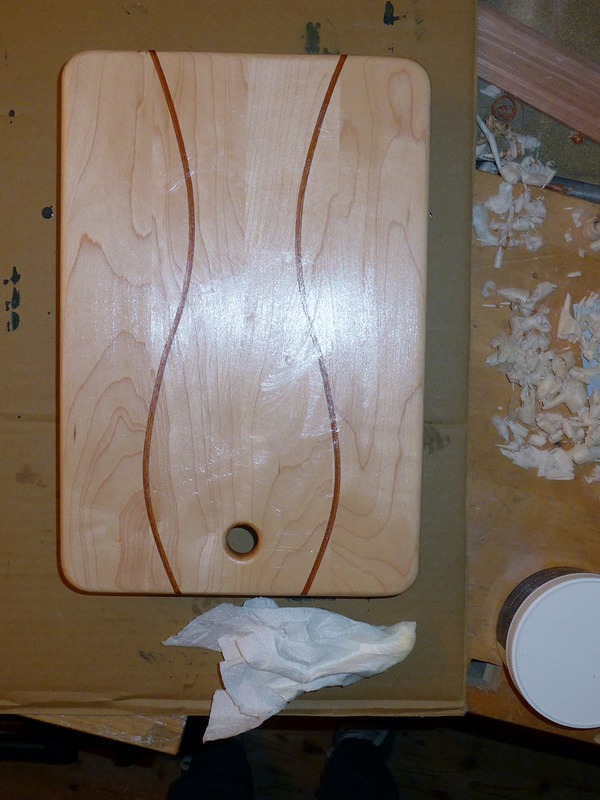 But I decided to try hand-planing it. So I sharpened the blade of my Record No. 4 Smoothing Plane and tried that. 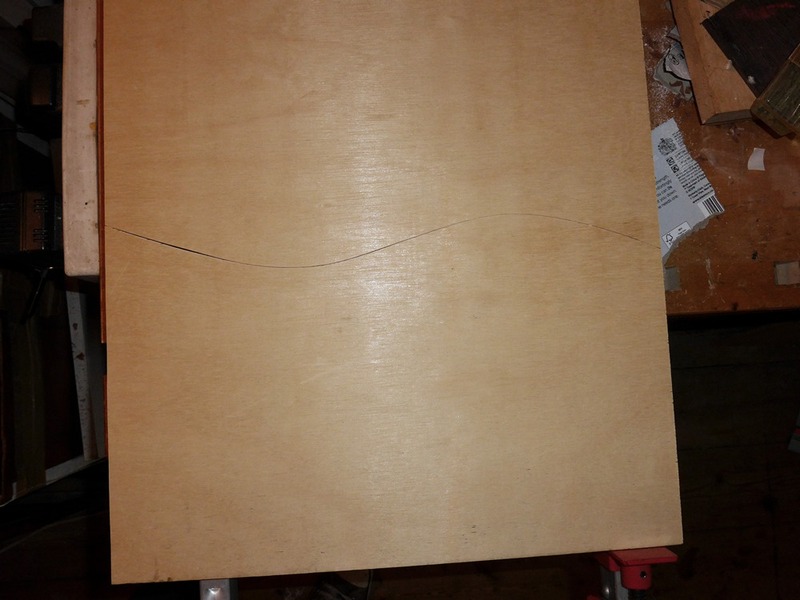 Almost straight away I had accidentally planed a step into the face of the board as the sharp corner of the plane iron had dug into the wood. 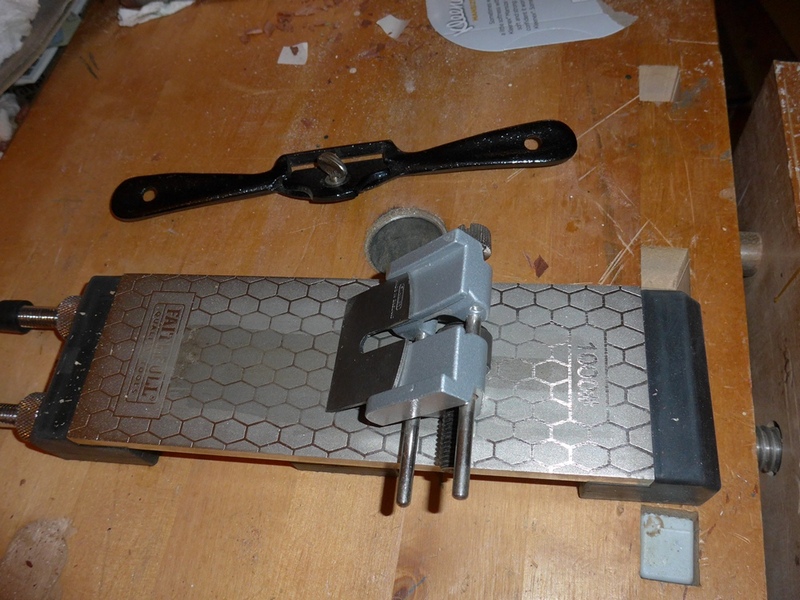 I remembered that the plane iron should not be square across the cutting edge but have a very slight curved profile to it, so the middle of the blade does the work and the ends don’t dig in. 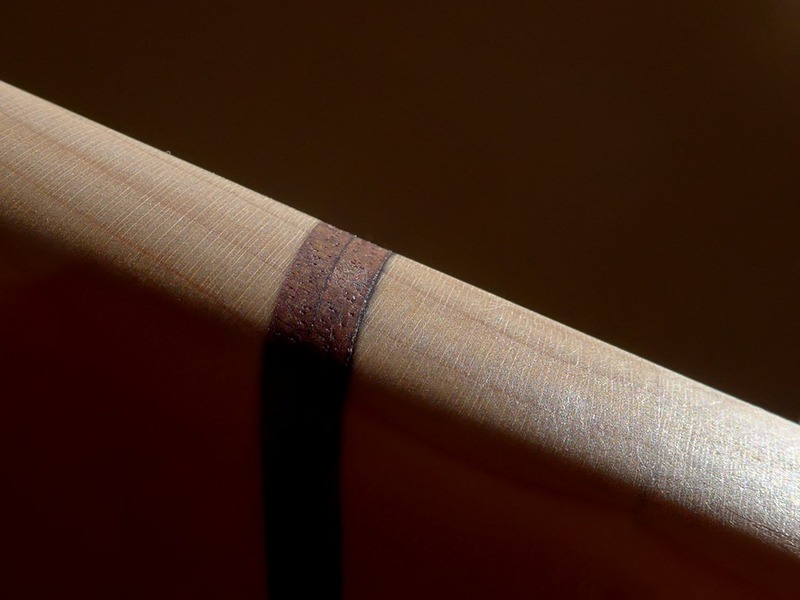 So I took the blade out again and spent quite a while honing the edge into a very slight convex shape. I kept checking it against the light using an engineering square. Eventually I could see that it was very slightly convex. 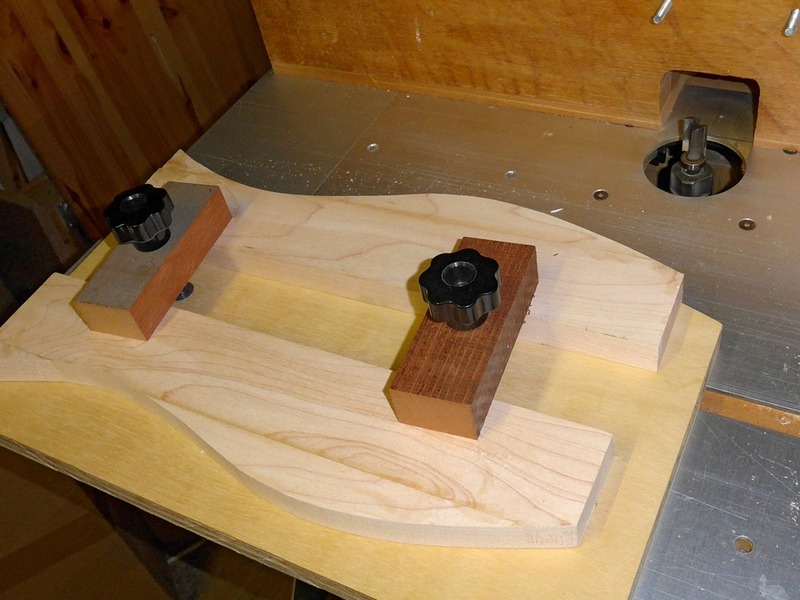 I installed the iron back into the plane and paid attention to setting the depth and alignment correctly. This time it worked brilliantly and I could take out all the high spots on the board and level up any misaligned joints. 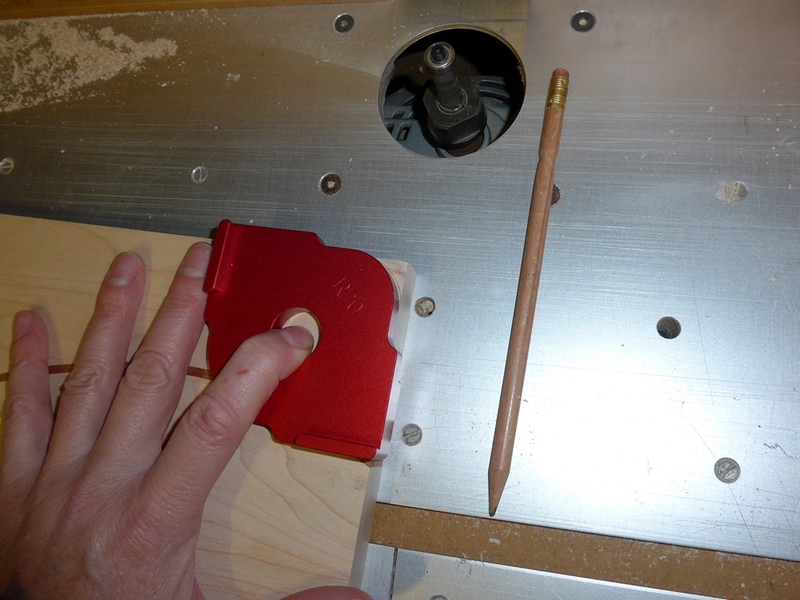 I noticed that the plane was only taking a very narrow shavings from the centre of the blade, maybe 15-20 mm wide. So I think I had curved the edge of the blade too much, even though it looked almost flat when lined up next to a straight edge. 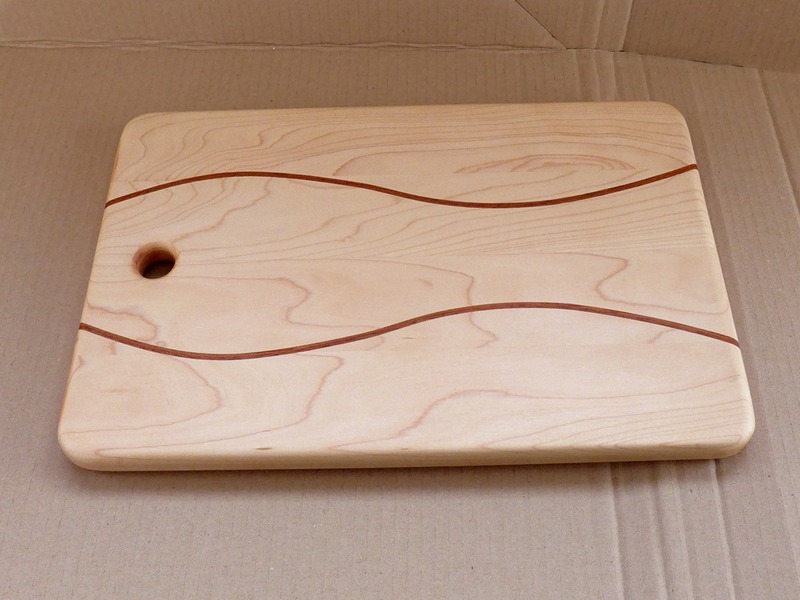 Anyway I was well pleased with the result – so much better than creating all that sawdust. 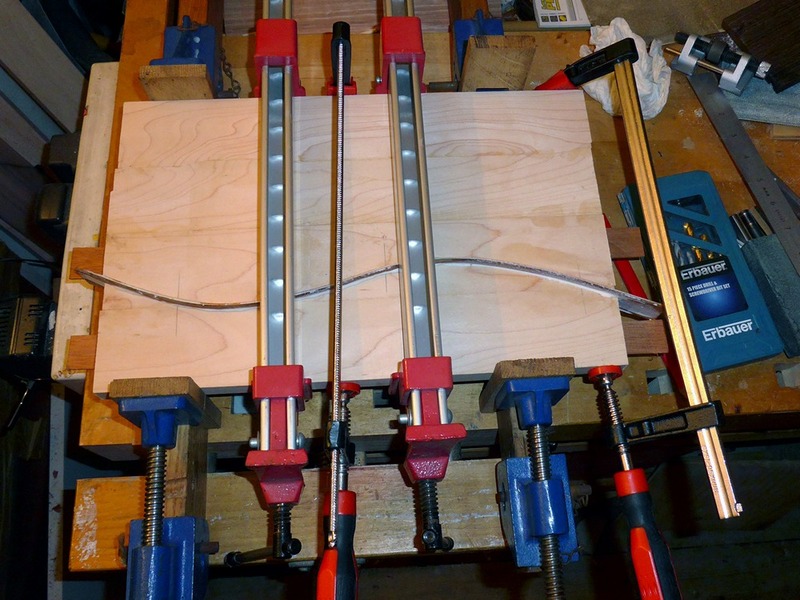 I didn’t get any tear-out during planing because I had taken the trouble earlier to align the grain in all the clamped-up pieces. 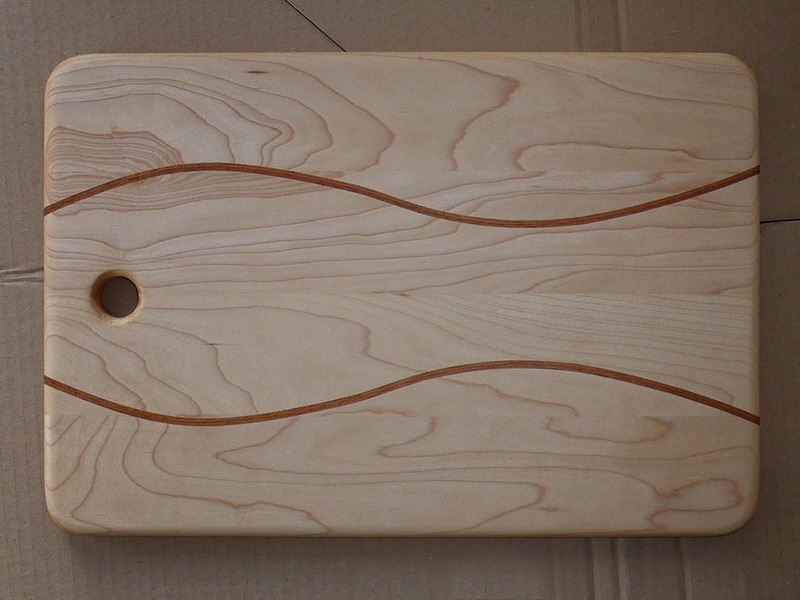 I still wasn’t sure exactly what shape the finished board should be, so I experimented in Photoshop with various shaped masks to see the effect, all the while considering how much work would be involved to realise each one. I liked the look of the scalloped edge but decided to keep it simple and just leave it rectangular with rounded corners. 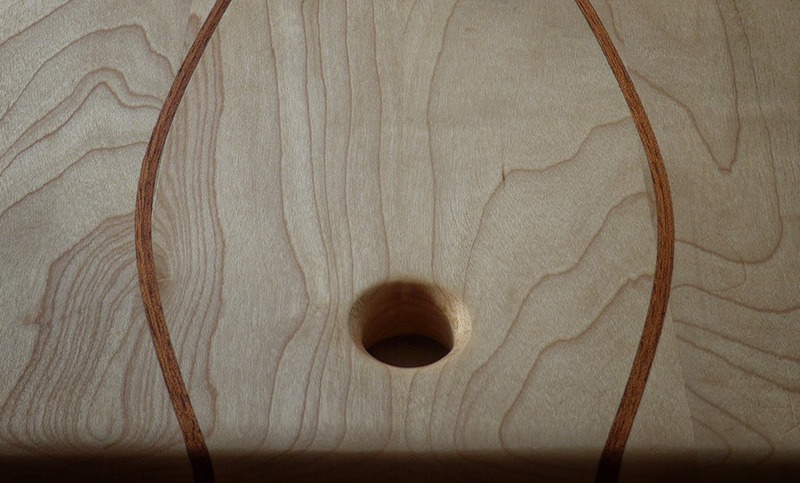 And because it looked a bit like a fish I put an ‘eye’ in there! 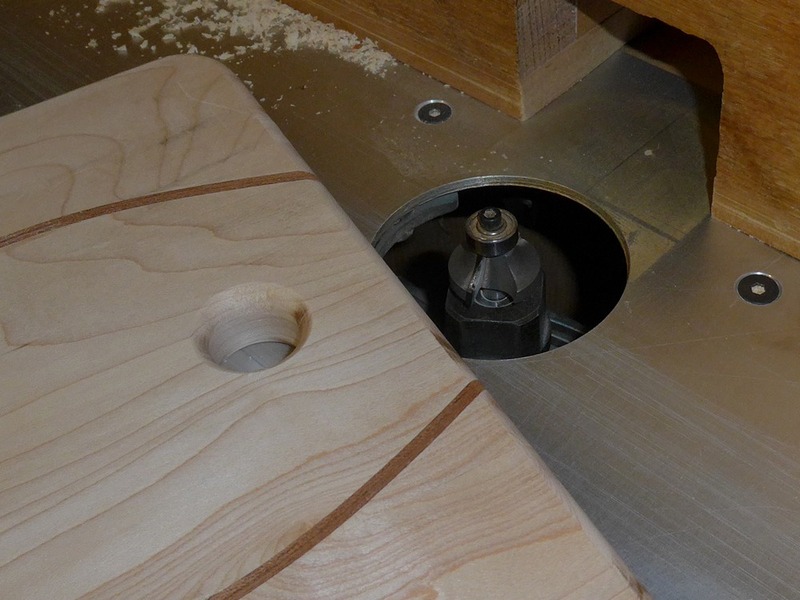 and then used the corner template to smooth the edges using a bearing-guided cutter in the router table. 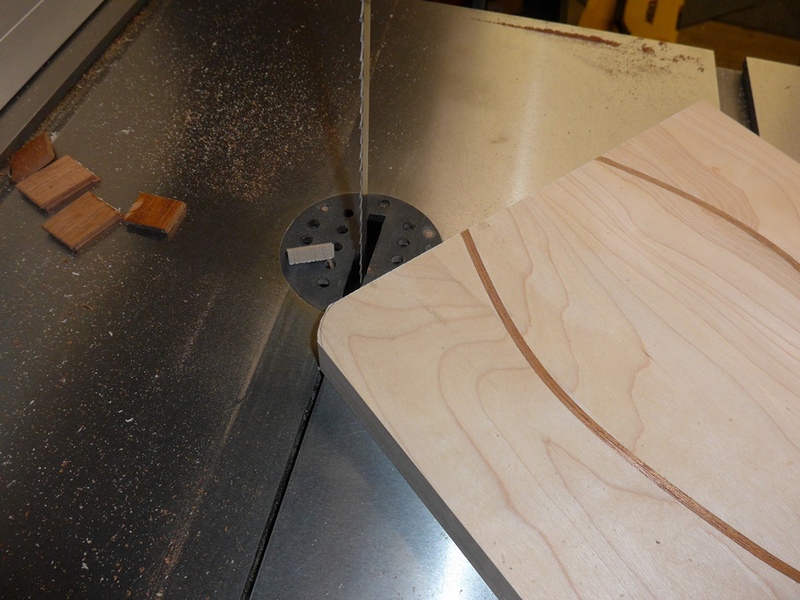 In an effort to prevent burning, I experimented with router cutter speed. 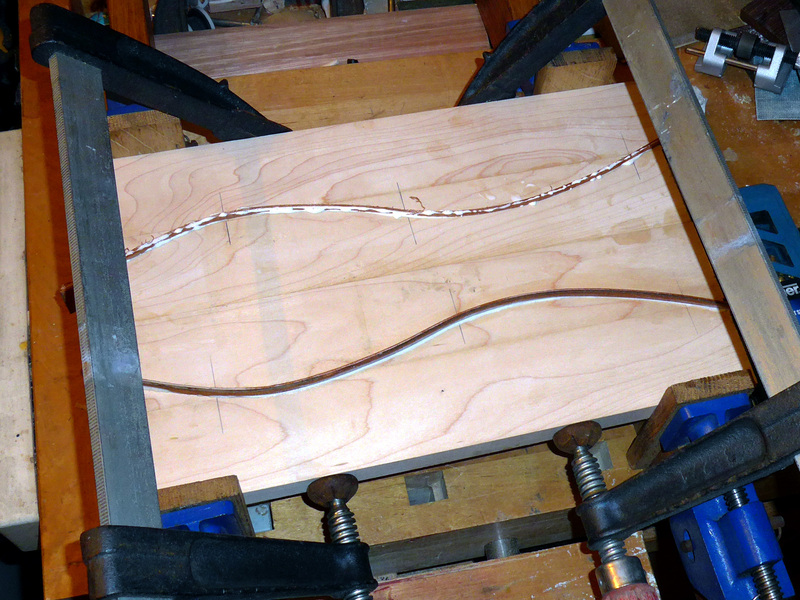 I reduced the speed of the router on each successive corner until, for the last corner, it was as slow as my router could go. 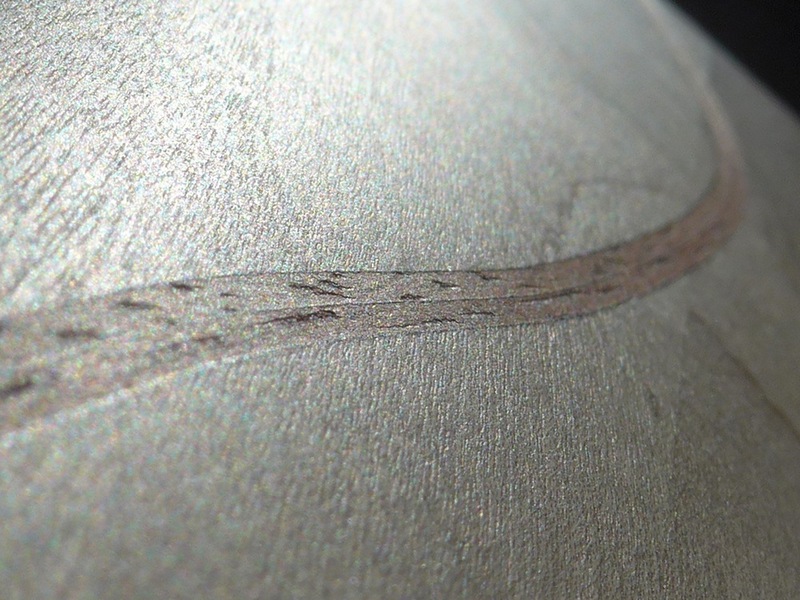 The slower speeds did produce lighter burn marks. 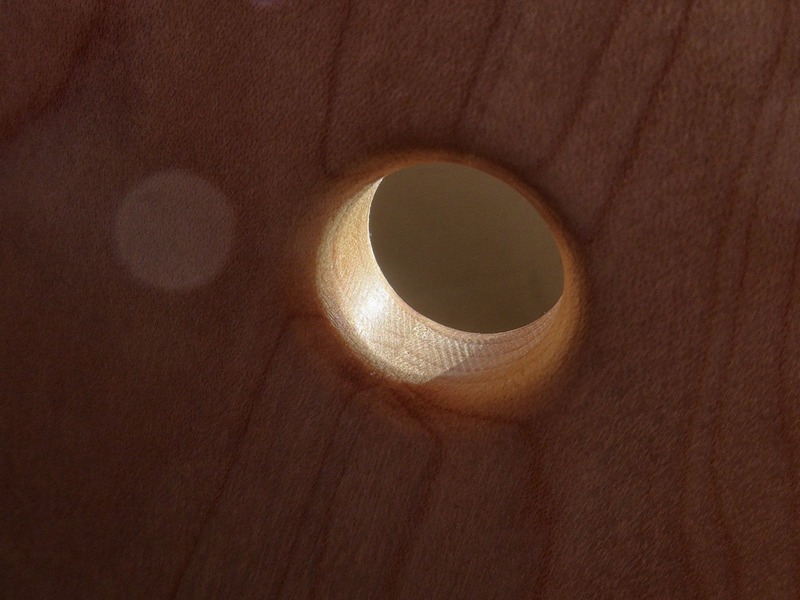 .. the edges of which I rounded over using a 3/8″ radius round-over bit in the router table. 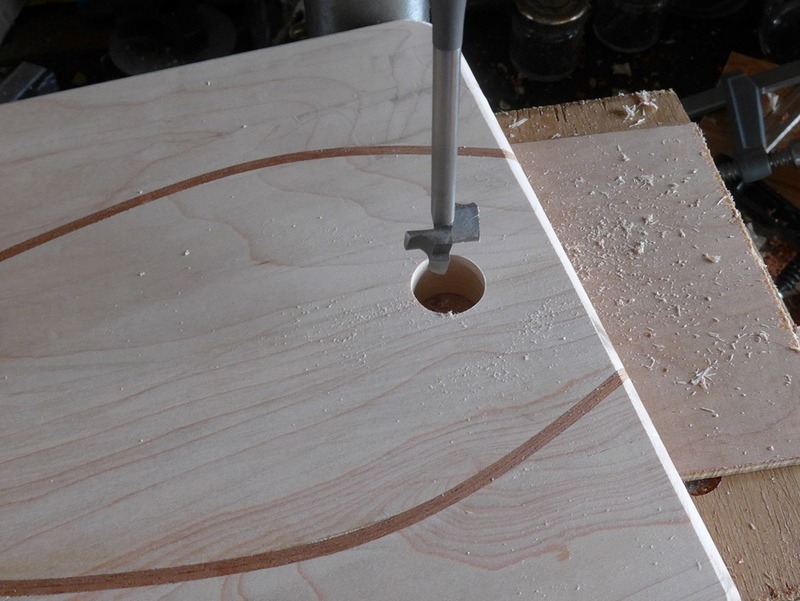 Normally I round the edges of a hole using the hand-held trimmer, but I discovered it can be done on the router table if you carefully position the hole centrally over the bit, lower it down and then make the cut, as briskly as possible to avoid too much burning. After a few hours I wiped off the excess and left it over night before buffing. I need to stick some sandpaper down onto the surface of the templates to help prevent the work-piece from moving during the cut. 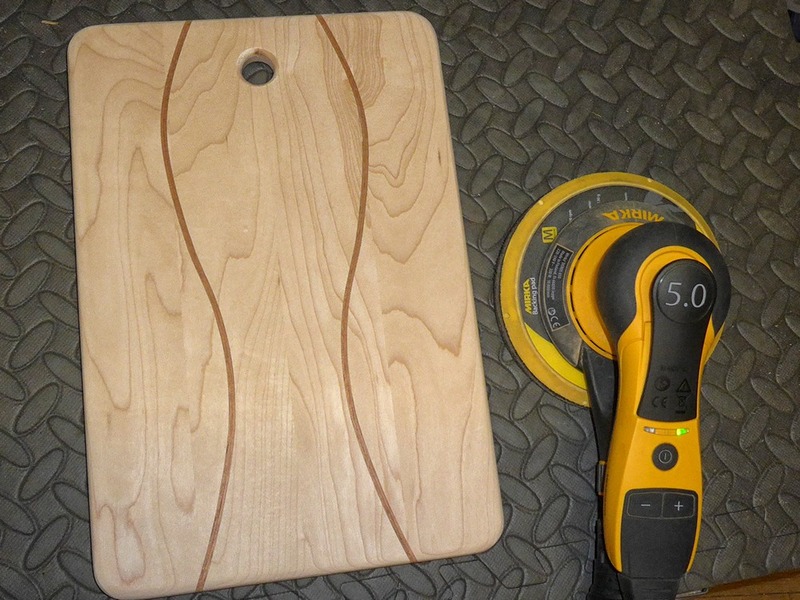 I would rather that the three maple parts of this board had each been one piece of wood, instead of being laminated from different pieces. 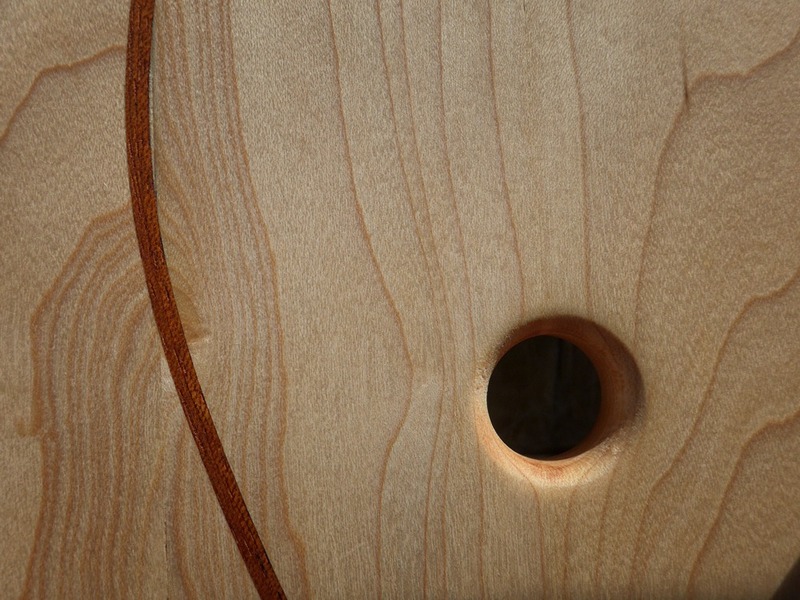 I don’t like laminated wood in general (don’t get me started on supposedly ‘solid wood’ furniture). 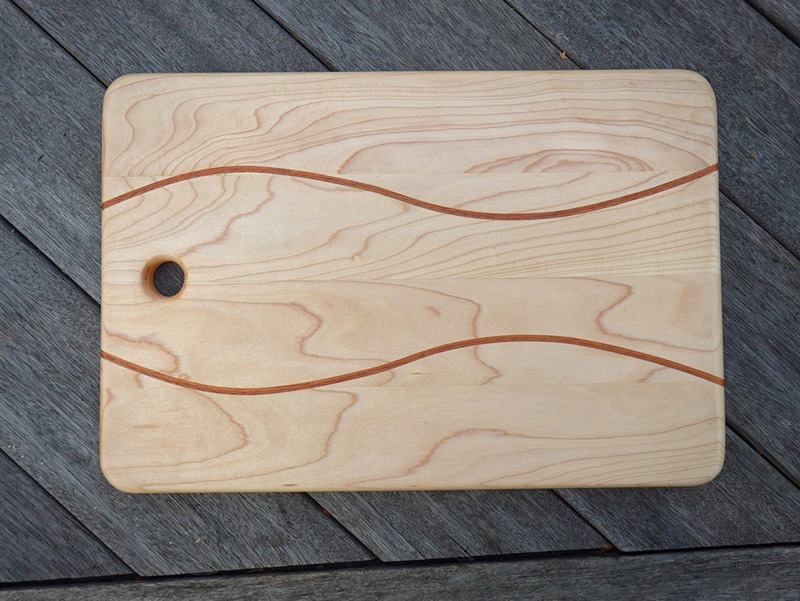 On this bread board some of the grain patterns almost matched up – that was purely by coincidence. 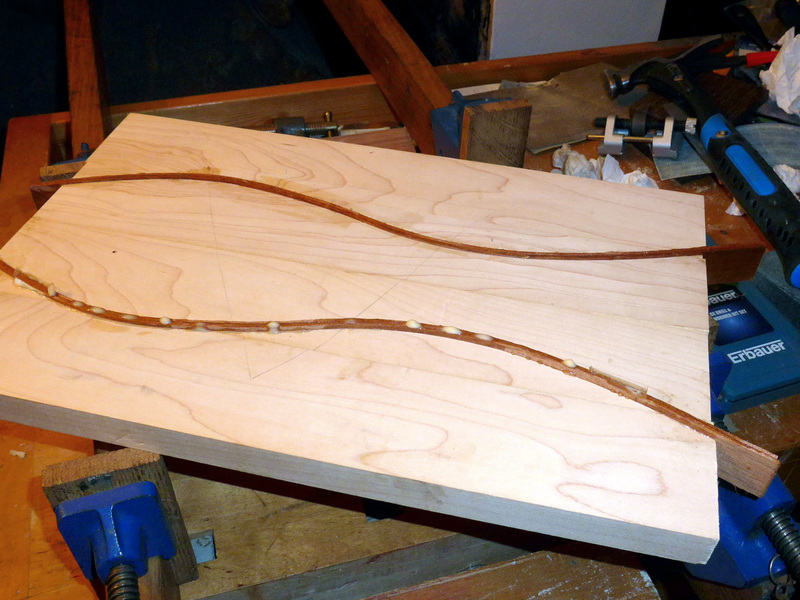 In other places you can see small slithers of the adjoining board where it’s been cut off by the wavy mahogany.